*Slight delay. Forwarded from old address. Chris Calloway is another receiver from the Great Blue of Michigan, who played opposite of blue chip prospect Greg McMurtry, finishing with 8 touchdown receptions. At 5’10”, 189 it was thought that the speedster may have been a bit small, but the Steelers pulled the trigger on him in the 4th round of the 1990 draft. He’d make 10 receptions his rookie season and 15 in 1991, but would find himself on the street in 1992. Calloway would find a home with the New York Giants who liked his speed, route running, and willingness to do the dirty work. Calloway would continue to build slowly off of his previous seasons with 335 yards receiving, endearing him to Giants fans. Chris in fact his first 6 seasons saw career highs in receptions and yards every season. 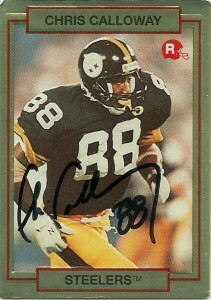 After a slight dip in 1996- Chris would peak with 848 yards receiving and 8 touchdowns in 1997. 1998 was a career high in catches for Calloway with 62. 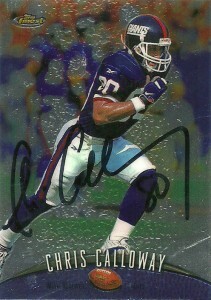 Chris signed with Atlanta in 1999 and start 6 games, making 314 yards receiving. He’d then play one final season in New England starting 2 games in 2000 before retiring in 2001. At the end of his career, Chris ranked 7th on the Giants receptions list with 334 catches. Among receivers Chris reminds me a lot of former Houston Oilers wideout Curtis Duncan. Since retirement, Calloway has not forgotten about football and avidly wants to get into coaching or scouting. He lives in the Altanta area and is also a member of SotL.